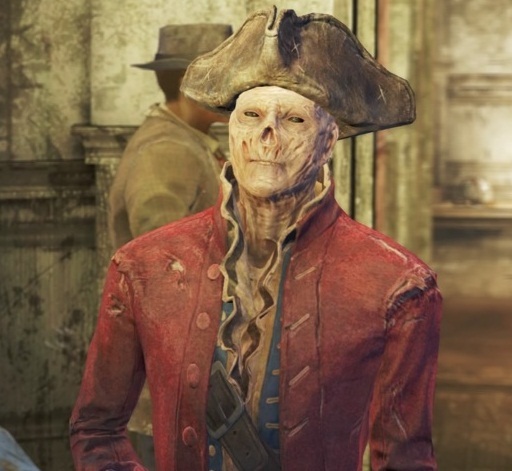 Hancock is a friendly ghoul who always running around with his old-fashioned three-cornered hat as a trademark in Fallout 4. But the helpful Mutant is not only the mayor of the Goodneighbor, but also a possible companion of your heroes. Where you can find him and how you can enhance the relationship with him, we will show you in the Companion Guide below. Silk from Diamond City all ghouls were banished, they have found in Goodneighbor, in the east of Boston, refuge. Here you will also find Hancock. In your first entering the city this is presented directly. A stranger speaks to you and demanded protection money from you. Thereupon intervenes Hancock and cares to his own way to the troublemakers. Then you can go to the left in the first building Old State House. There Hancock holds on the balcony on the first floor a speech to the population. If you want to find the ghoul Hancock, you have to visit the city in the east of Goodneighbor, Boston. Because there are the ghouls of Diamond City have settled, since they were expelled from the city. Meanwhile, even more unpopular figures have gathered there and Hancock ruled as a benevolent mayor over the whole bunch. In your first entering to the city a stranger speaks to you and demand protection money from you. Thereupon Hancock intervenes and assists you in a confrontation with a racketeer. Then you can go to the left in the first building - Old State House. There you will find Hancock on the balcony. To win Hancock as a companion, you must first complete the side quest The Divide. - Get your quest from Bobbi in a side street of the city. - She asks you to help with excavations..
- This is followed by fight against aggressive Mirelurks and a dubious meeting in Diamond City. Then you learn that it is a raid. - Go back to the excavation, where Bobbi and Mel wait. Then shoot you through the tunnel to the vault. - What a surprise! Bobbi has actually apart on Hancock's possession! - You can now kill Bobbi, dissuade by diplomacy of her plan or kill everyone except Bobbi. - But don’t worry: No matter how you decide, at the end you can go to Hancock and recruit him as a companion. Hancock is a ghoul, his greatest strengths are his resistances to the weather conditions of the wasteland. Nuclear storms and radioactivity can not harm him and strengthen the contrary, even his health. Also in the fight, he is a valuable support and can hold his own with a shotgun. Although Hancock has a decaying hard shell, but rated selfless behavior on your part very positive. He also appreciates when her either diplomatically or if it needs to be because at the right moments, force going. Are you selfish or groundless mean to other NPCs, your relationship suffers to Hancock with minus points. Although Hancock looks bad, but he is a true do-gooder and always helpful and selfless. So if you conduct yourself like and are always striving to do good, then you have really fond of Hancock. However, if you are selfish or groundless to other NPCs, your relationship suffers to Hancock with minus points. You can also enter into a romance with Hancock. Improve your relationship simply by the positive actions above or by conduct dialogues in order to bring the relationship to the highest level. - Isodoped: If you are contaminated with 250 wheel or more, your critical beams will charge 20% faster. - Pillow Talk: You gain + 15% experience points for a limited time.